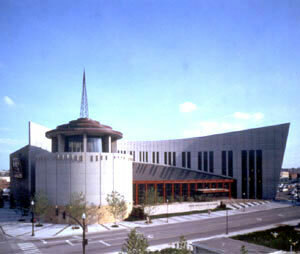 The new Country Music Hall of Fame and Museum opened in 2001. One of the most-visited popular-arts museums in the United States, the Country Music Hall of Fame and Museum is now located in a $37 million facility of 135,000 square feet in downtown Nashville, next to the Sommet Center. The new museum building opened in May 2001. Operated by the not-for-profit Country Music Foundation, the museum features thousands of items, including costumes, instruments, recordings, song manuscripts, historic cars, and film footage representing hundreds of country music personalities, past and present. The new building was designed by Tuck Hinton Architects of Nashville. Drawing upon the vast resources of the foundation’s museum and library holdings, exhibits are designed to be both educational and entertaining and explore today’s country scene as well as the music’s history as art and enterprise. The jewel of the museum is the Country Music Hall of Fame proper, whose plaques honor performers, songwriters, executives, and other outstanding individuals in country music. Many native Tennesseans–including Roy Acuff, Chet Atkins, Eddy Arnold, Uncle Dave Macon, Owen Bradley, Tennessee Ernie Ford, and Minnie Pearl–are showcased, along with persons from other states. The mural The Sources of Country Music, the last work of legendary painter Thomas Hart Benton, is also on permanent display, though the museum has loaned this classic artwork to other institutions from time to time. Sing Me Back Home: A Journey Through Country Music, the museum’s core narrative exhibit, traces the growth of country music from its folk origins to its present status as an international industry. Temporary exhibits lasting a year to eighteen months typically showcase major artists who have had a significant impact on country music history, often by linking country and other popular music styles. Featured artists have included honky-tonk pioneer Ray Price, banjo master Earl Scruggs, the versatile Marty Robbins, legendary singer-songwriter Hank Williams, and the genre-spanning, African American performer Ray Charles. Museum guests may also visit the foundation-owned Hatch Show Print, a downtown Nashville printing firm in the Lower Broadway historic district that has catered to the Mid-South’s entertainment industry since 1879. Hatch specializes in posters made from hand-carved wooden blocks and offers some one hundred prints for sale.